Craving the Beach? 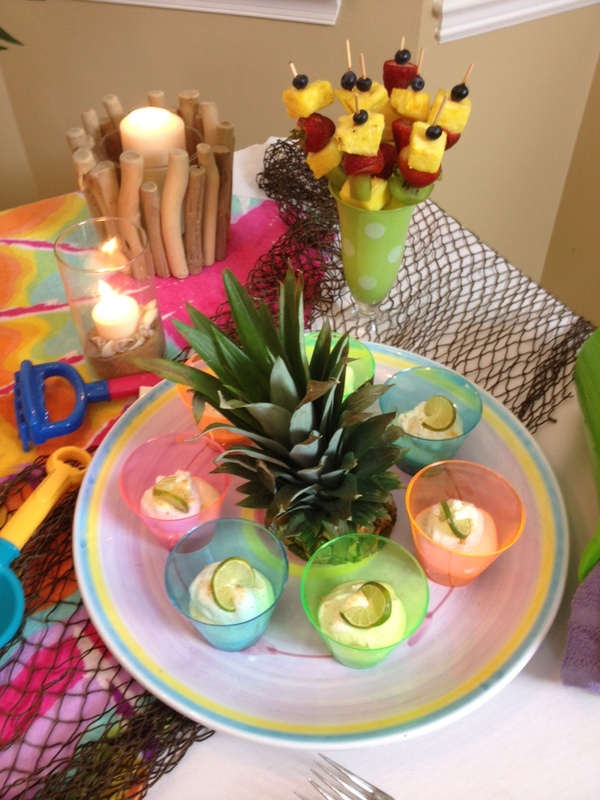 Have an Indoor Beach Party! 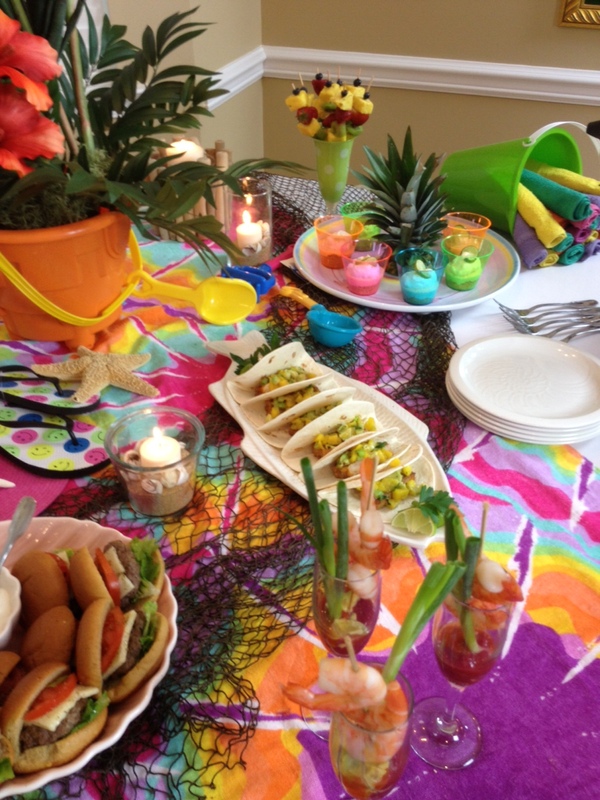 When the weather turns cold and you are craving some beach time, throw an indoor party with a beach theme. Here are my tips on YouTube on how to create the atmosphere with decorations and food from the tropics. 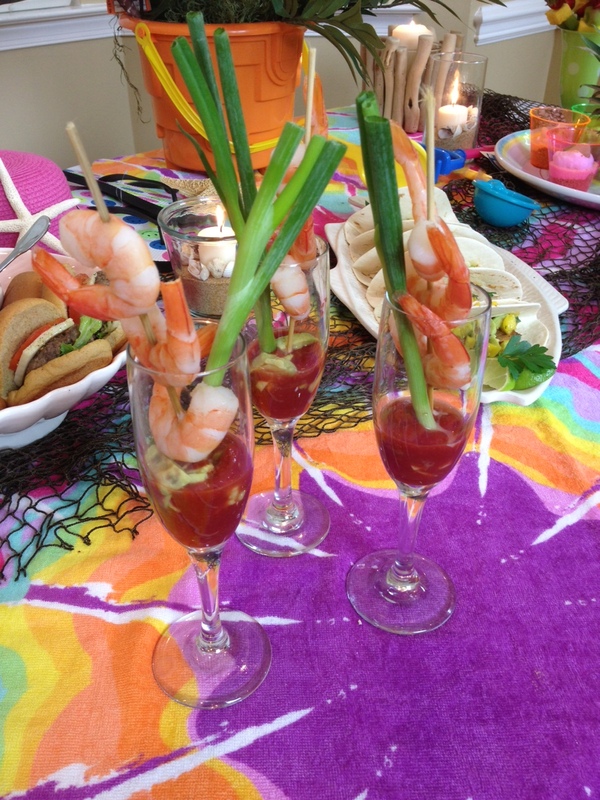 Serve these in champagne flutes. Mix chopped avocado with lime juice, salt and pepper, set side. Thread three shrimp on a wooden skewer. Any kind of fresh, fleshy fish will work, such as Mahi Mahi, Flounder, Grouper. Really, whatever white fish is on sale is great. Make the mango salsa by combining mangos, scallions, avocados, cilantro, lime juice, salt and pepper. Set aside. Season the fish with any type of seasoning you like (this is where you improvise to suit your own taste buds). I’ve used blackened seasoning, Old Bay, salt, pepper, cayenne. Drizzle some olive oil over the fish to get ready to cook on the grill or a stove-top pan. Cook the fish about four minutes on each side for a total of 8-10 minutes (depending on thickness, this is only a gauge). Fill taco shells with fish and top with mango salsa. Use real key limes for an authentic taste. Because the Florida Keys had no refrigeration until the Overseas Highway opened in 1938, bakers had to use canned milk, so sweetened condensed milk became an essential element of Florida’s state pie. This version of Key Lime Pie has a filling that doesn’t need to be baked so it’s perfect for little tartlets. Serve in tropical-colored cups and top with slices of Key lime. 1/3 cup Key Lime juice (use a citrus reamer to extract the juice) or, use Nellie and Joe’s Famous Key West Lime Juice, found in some grocery or specialty stores. Heavy whipped cream, whipped with 1/4 cup of sugar and 1/4 teaspoon of vanilla. Make a graham cracker crust. Follow the directions on the box for a one-crust pie using melted butter and sugar. Mix and set aside. Combine condensed milk and Key Lime juice with an electric mixer. Fold in the beaten egg whites into the milk mixture. Assemble tartlets by pressing about one tablespoon of graham cracker crust into the bottom of a cup. Top with about one-fourth cup of Key Lime pie filling. Chill for at least three hours. When ready to serve, topped with whipped cream and a Key lime slice. Can She Make a Healthy Pie, Billy Boy, Billy Boy? And cannot leave her mother. Every time I think about, crave or eat cherry pie, the traditional folk song “Billy Boy” comes to mind. It’s one of those nursery rhyme-type songs that Aunt Dot used to sing to “Billy,” my husband, each time he scampered through the house. Last Sunday, in the bleak mid-winter, I was craving cherry pie made with sour cherries which obviously are not in season. 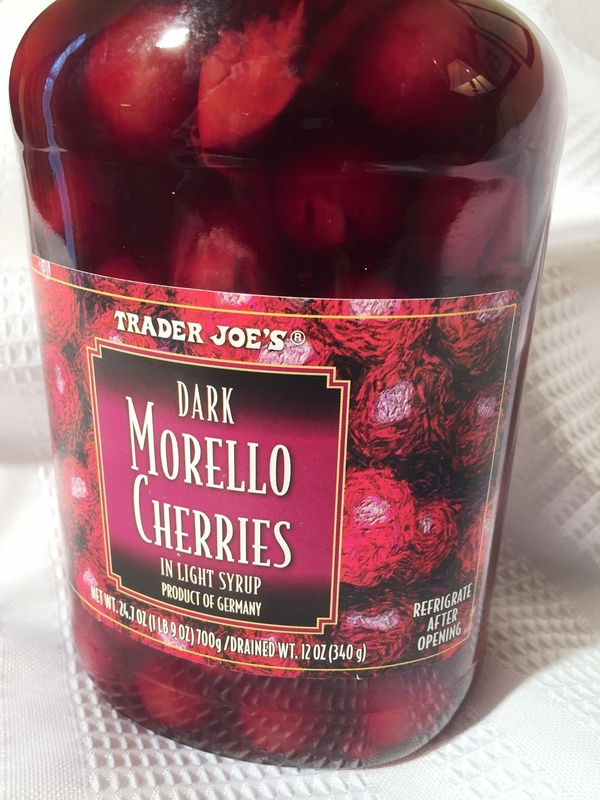 To the rescue is Trader Joe’s deep purple Morello cherries, imported from Germany. Here’s a healthy pie – Billy Boy, Billy Boy – made with whole wheat flour and sour cherries resulting in a filling that is not overcome with a heavy sugary cornstarch filling. Besides, a pie like this one is great for breakfast – fruit and a whole wheat crust. Use jarred Morello cherries when you can’ t get fresh. They retain their tart flavor and meaty texture. Do not use canned cherry pie filling. Heat oven to 500 degrees and adjust oven rack to the bottom rack. Place a rimmed cookie sheet on the rack. Mix the sugar, cornstarch, cinnamon and salt. Stir in the cherries and the almond extract. Spread the filling in the unbaked pie crust bottom. 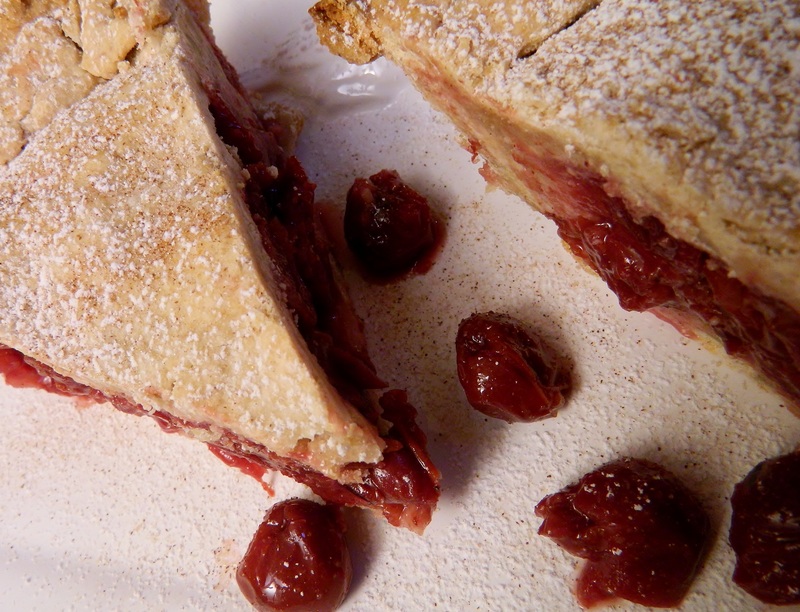 Place top pie crust over cherries, seal and crimp the edges and make four air slices. Sprinkle with a tablespoon of sugar. Place the pie on the heated baking sheet and lower oven temperature to 425 degrees. Bake for 25 minutes. Rotate the baking sheet, lower oven temperature to 375 degrees and bake for about 35 minutes until crust is golden brown and filling is bubbly. Makes enough for one 9-inch pie crust. Double the recipe for a top and bottom crust. Whisk together flour, salt and sugar in a large bowl. Rub in coconut oil with your fingertips or use a hand mixer on low speed. Using a fork, stir in cold water until dough almost comes together into a ball. Add water gradually, a tablespoon or two at a time. Press dough into a ball, divide in half, and wrap in plastic. Chill for at least one hour. When ready to use, let the dough come to room temperature (coconut oil hardens firmer than butter). Use flour on the surface to prevent sticking when rolling it. Don’t Try This Trick at Home! I could have titled this blog “The Amazing Exploding Hungarian Noodle Casserole.” Make no mistake, this is a delicious and hardy accompaniment for a Beef Bourguignon or similar entrée. But, my first experience in serving this to my guests taught me several valuable lessons. Lesson 1: fire and noodles don’t mix! Stunned, we all were paralyzed, jaws dropped as we gawked at the Baked Hungarian Noodle Casserole that had literally EXPLODED!. Glass shards and noodles littered the buffet table. The dinner was ruined — glass penetrated every nook and cranny of the food and surrounding area. Silence. No…one…said…a…word…and turned toward me. The crowd exploded (pun noted) in laughter and applause! What else could we do? Several folks helped with clean up, in disbelief that Pyrex would shatter like that! I pulled some back-up food from the fridge and brought out more wine and desserts. Lesson 2: It doesn’t matter what you serve people, whether it’s fancy or low-key, hospitality is from the heart. The main thing is to make people feel you are glad they came. Famous chef Julia Child wrote in her autobiography that on a few occasions she served dishes that flopped and she only realized it when she took a bite along with her guests. She never batted an eye or drew attention to the food, focusing on her guests the entire time. I am making this recipe for Christmas Eve dinner this year. Lesson 3: No Sterno and no Pyrex this time. This recipe, from A Private Collection published by the Junior League of Palo Alto, is written to serve 24 guests because it’s suitable for a crowd. It can be easily divided by 2 to serve 12. This can be made well in advance of the party. You might question only one pound of noodles for 24 servings; be sure to use only fine noodles to get the proper volume. Cook noodles in boiling, salted water until tender. Drain. Combine the noodles with the remaining ingredients except the paprika and Parmesan cheese. Place in two or three buttered casseroles and bake at 350 degrees until hot. Or, put in refrigerator at this point until ready to use. Approximately 30 minutes before serving, remove from refrigerator and bake until hot. Sprinkle with paprika and serve with Parmesan cheese. ‘Tis the season for red and green and easy-to-carry party food. 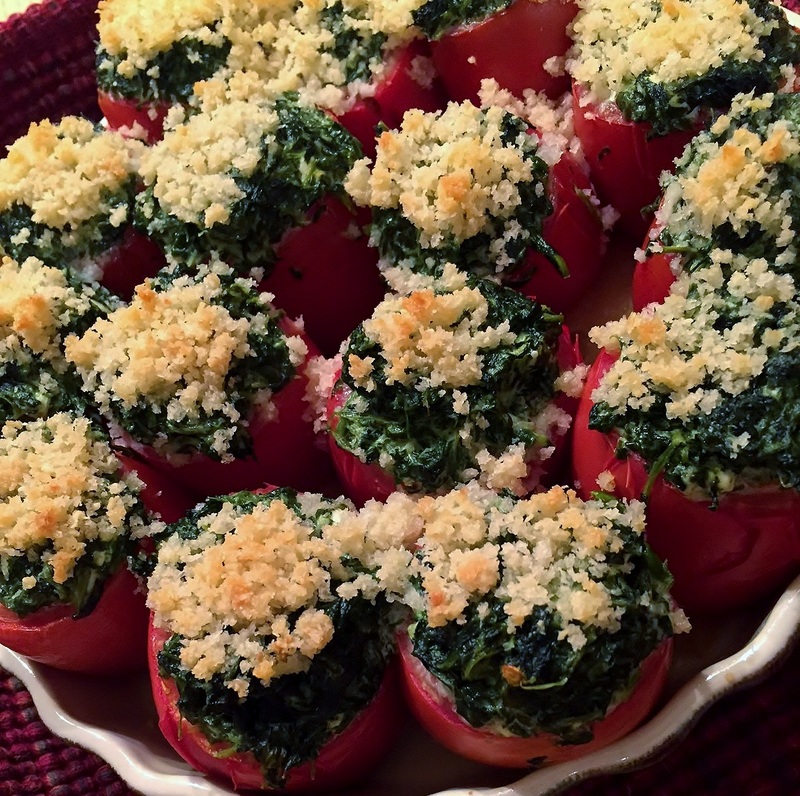 Spinach stuffed tomatoes provide all the color you need and this dish is easy to make ahead (even the day before) and bake when you need it. This tasty veggie dish is also a hit when you have to take something to a party because baked-ahead tomatoes can be eaten at room temp. Wash tomatoes and slice a small slice off the stem end so the tomato will sit upright in a baking dish. Cut off the top of the tomato and scoop out the pulp. Lightly sprinkle the inside of the tomatoes with a little salt. Spray baking dish with cooking spray and place cored tomatoes in dish. Add butter, cream cheese, onions, salt and pepper and combine until butter and cheese is melted. Spoon spinach mixture into tomatoes. Top with parmesan/bread crumb mixture. Bake for 350 degrees for 25 minutes. Can make ahead and hold in refrigerator for two days before baking. 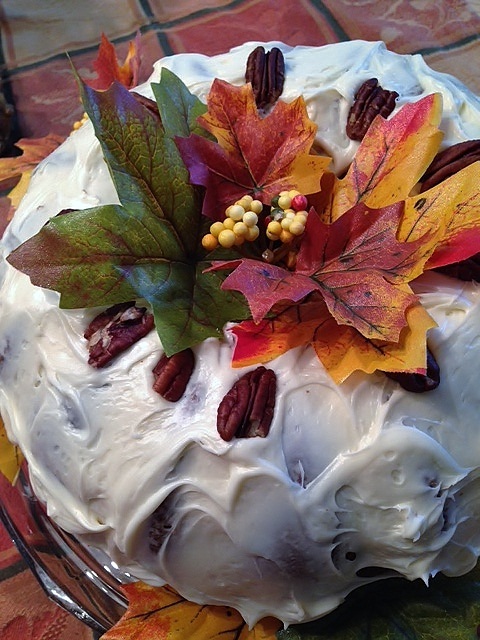 The leaves are falling this time of year….right onto your cake! Dress your pumpkin cake up with some silk leaves for a fall look and a great dessert centerpiece for a dessert table. I used this recipe but baked it in a Bundt pan. 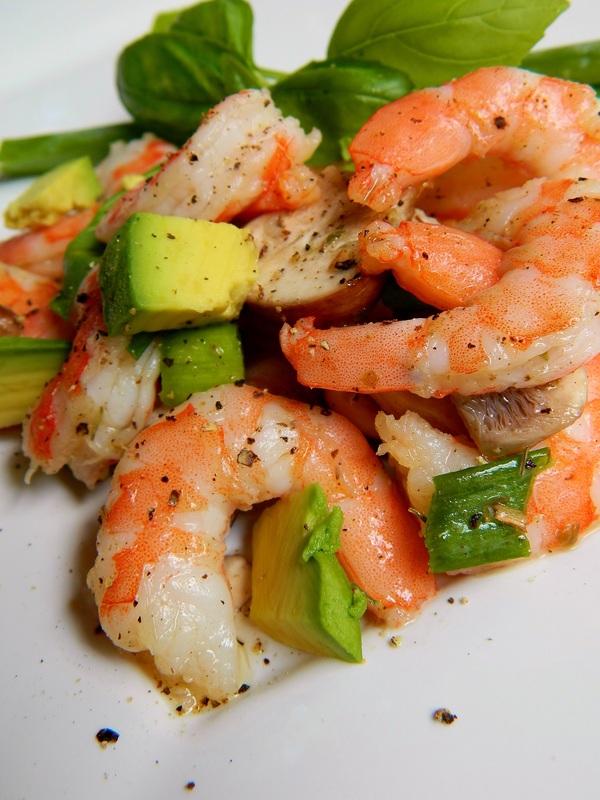 Susie makes a succulent marinated shrimp and avocado salad. I’ve never met Susie but I couldn’t help but think about her yesterday when preparing this dish for a picnic. Now you know Susie like I know Susie. Enjoy one of her signature recipes. Combine the shrimp, onions and mushrooms in a bowl. Toss lightly. Pour in the Lemon-Thyme Marinade and toss gently to coat. Chill covered in the refrigerator for 12-24 hours. Add avocado a few hours before serving. Drain the marinade and serve. Whisk ingredients in a medium bowl until well combined. 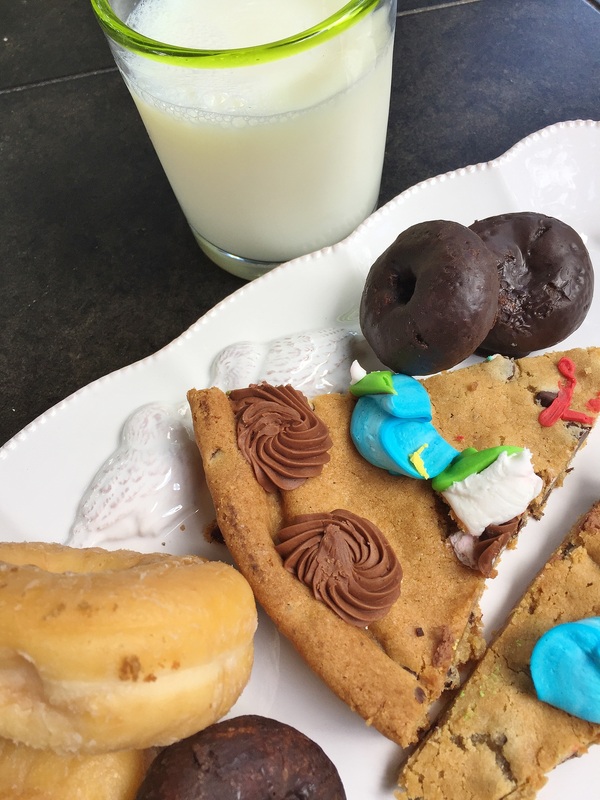 The boys coined the term and appreciate the oxymoron-ness of “yesterday’s fresh-baked goods.” For a few years, the Friday-night destination has been Giant Food where the rack in the back holds the day-old bakery bargains. They used to venture on their bikes, but now that they are 16 and can drive, it’s the car. No matter the mode of transportation, the destination and the goal remains the same. They come home with bags, grins, and a sugary score. Pour some milk and the feast begins!